Have you ever heard the age-old question about whether it’s possible to drill a square hole? Everybody snickers and giggles, and says “of course you can’t drill a square hole!”. Well it turns out the correct answer is “yes”, you most certainly CAN drill a square hole…and a rectangular hole, and a hexagon shaped hole, a hole with splines, double keyways…and the list goes on and on! Rotary Broaching is a manufacturing method that allows us to create both internal and external shapes on the end of a round workpiece very quickly, with simple tooling and in the same machine setup as our other machining operations...eliminating the need for additional setups and costly dedicated broaching machines. This not only makes it fast and efficient, but also makes the process more accurate and controllable than the older technology. 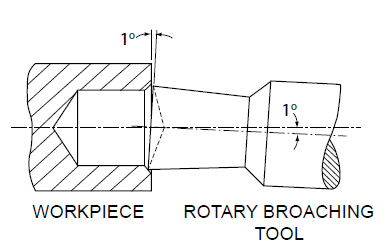 Although Rotary Broaching has been around for decades, very few people know much about this mystical machining practice; and, because the entire premise of drilling a square hole is so foreign to many us, even after you see it with your own eyes you still might not believe it. However, once you get your mind wrapped around the simple science of it all, you can see that it really isn’t magic, and that it is one of those manufacturing wonders that can really make a difference. …but whenever I see something like this, I have to ask myself: “who the heck thought of that?!?!”. As I said, the science is pretty simple. The secret is in the 1° tilt angle that is built into the holder. The cutter is mounted into a tool body that has been fitted with a bearing, allowing the tool to rotate freely. Tool rotation is driven by either the spinning workpiece or the machine spindle - depending on the operation. In the case of a lathe broaching operation the tool is driven by the part once it makes contact with the rotating workpiece. However, in the milling operation the tool stops rotating as it contacts the stationary workpiece, and the rotation is present only in the spinning tool body – which is being driven by the machine spindle. 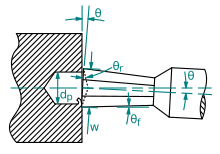 In both cases the rotation causes a “wobble” effect to be present at the tip of the tool – due to the 1° tilt angle of the cutter (picture spinning a bent drill bit) – which causes pressure to transfer from one corner of the cutter to the next as the rotation continues. 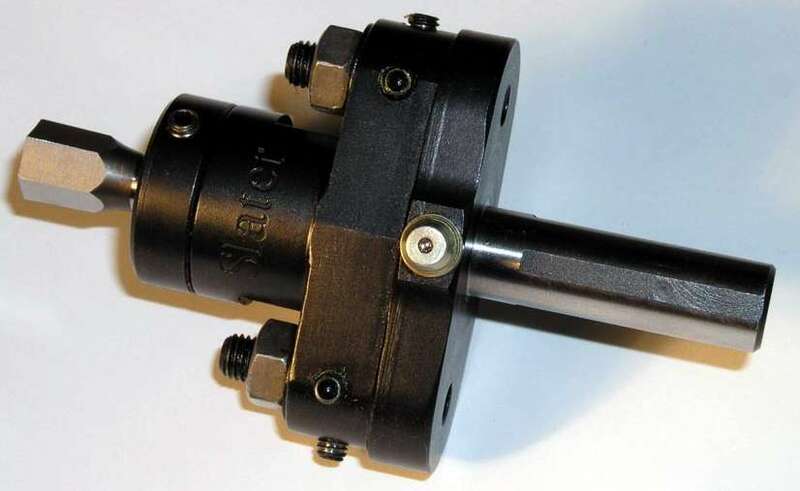 Also, the sides and the end of the broaching tool have been relived with drafted angles to allow for clearance, and to insure that only the sharp cutting edge of the tool is contacting the workpiece. As the linear forces of Z-axis movement are applied, the cutting process becomes more like a shaving process than a cutting one…much like a wood chisel shaves off wood. Rotary Broaching can be a real time saver, and will offer shops a cost effective way to quickly and easily form those frequent features called out on many blueprints - internal or external splines, hexes, and wrench flats - without the need for the added cost of live tooling lathes, or additonal secondary machining processes and setups.